Summary: James isn’t too enthusiastic on his first day of school. 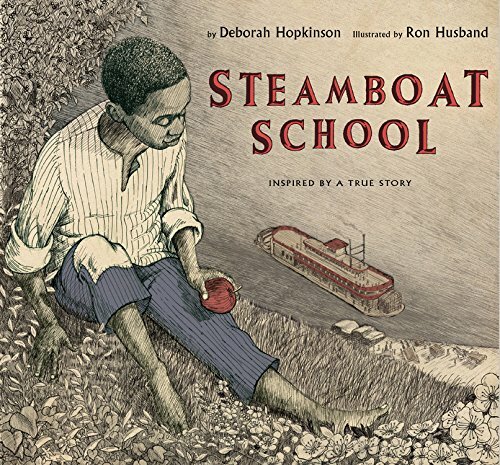 Held in a windowless church basement, it’s the only school available for free blacks living in Missouri in the 1840’s. It’s called a Tallow School, because it’s lit by candles. “We make our own light here,” explains his teacher, Reverend John. When a state law is passed prohibiting schools for “negroes and mulattoes”, Reverend John is undaunted. He spends months building and refurbishing a steamboat on the Mississippi river. Finally, one morning at dawn, the children meet their teacher, who rows them out to the boat. It’s a school! And state law doesn’t apply to the river, so the students are safe to resume their education. An author’s note tells more about John Berry Meachum, who was the real Reverend John. Pros: A fascinating and inspiring piece of historical fiction, beautifully illustrated by the first African-American animator at Walt Disney Studios. Cons: Not much is known about this school and the students who attended it.